(Sept. 28, 2018) – The University of Texas at San Antonio (UTSA) will honor its fall graduates in one of two Commencement ceremonies on Sunday, December 16. More than 4,200 UTSA students are eligible to walk the stage at the Alamodome during this memorable occasion. All graduate students’ names will be called and their photograph taken upon receipt of the diploma presented along with an honorable handshake from UTSA leadership. The first ceremony begins at 10 a.m. to honor graduates from the College of Architecture, Construction and Planning, College of Business, College of Education and Human Development and College of Public Policy. At 4 p.m., the second ceremony will be held to honor graduates from the College of Engineering, College of Liberal and Fine Arts, College of Sciences and the University College. The celebration comes at a time when the university is seeing a substantial rise in graduation rates. New 2018 numbers indicate a three percent increase in both students who graduate in four years (to 25%) and also in six years (40%). In order to prepare for a successful Commencement, graduates should plan to attend Grad Fest, which will provide students with important information about the ceremony and life after UTSA. The festival features prize giveaways, such as, diploma frame, set of regalia, and a fun selfie station to take pictures. Monday, Oct. 15, 10 a.m. to 7 p.m.
Tuesday, Oct.16, 2 p.m. to 6 p.m.
UTSA class rings are also available for graduating students. During one of UTSA’s most unique traditions, the rings sleep in the Alamo before the Ring Ceremony, when students receive this lasting symbol in front of family, friends and university dignitaries symbolizing their student success. Learn more about UTSA graduation. 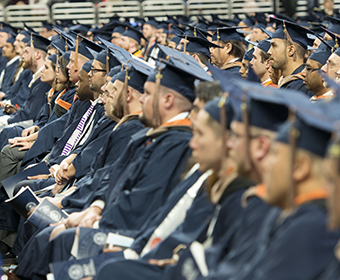 Learn more about UTSA Commencement and share your stories with us on Facebook, Twitter and Instagram using #utsagrad18.